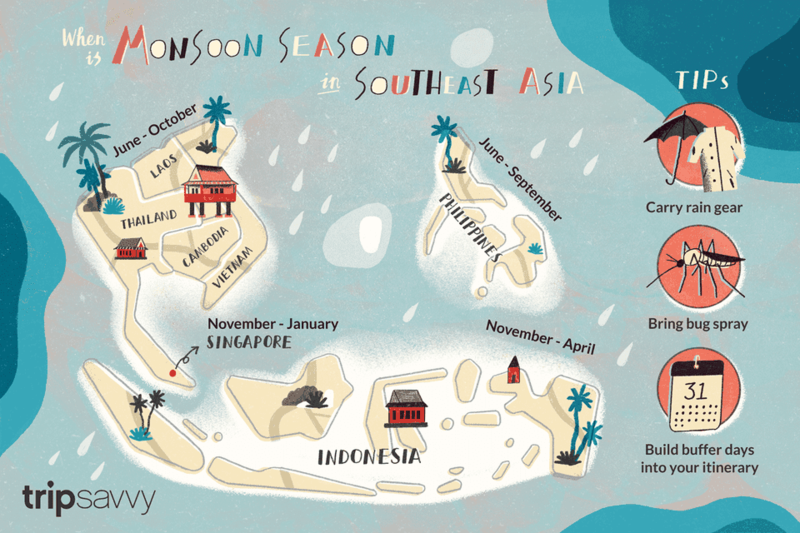 Although Mother Nature doesn't always follow the rules, the weather in Southeast Asia is somewhat predictable. Most countries experience two distinct seasons: wet and dry. Unless you're up in elevation, this region of the world sits close enough to the equator to stay warm throughout the year. And, tropical or not, nights often feel cool, anyway, after an afternoon of sightseeing in scorching temperatures. Sunshine is ideal for any trip to Southeast Asia, however famous attractions and popular destinations are the most crowded during the dry and sunny months. Traveling during the rainy season is a mixed blessing. Although rain and mud may affect outdoor plans, such as jungle trekking and scuba diving, you'll encounter fewer tourists and can negotiate better prices on accommodation. Depending on your location and itinerary, visiting during the southwest monsoon season, in particular, can have a significant impact on your plans. And while monsoon rains are usually more of a temporary annoyance than a showstopper, tropical storms or typhoons, when they make landfall, can wreak havoc on regional countries. Always be prepared when traveling during the monsoon season; weather can change with little warning. Carry necessary rain and emergency gear and build buffer days into your itinerary, particularly if you have a flight to catch. Heavy rain can affect road conditions and cause delays in public transportation. Additionally, as wet conditions cause an increase in the mosquito population, dengue fever becomes prevalent. Learn how to protect yourself and know the symptoms of this mosquito-borne illness. In northern Thailand, the dry season extends from November through May, with the latter half of that time period experiencing higher relative temperatures. Expect temperatures to hover around 86 F/ 30 C in Bangkok during this time. The rainy season up north starts in May and ends in November. In places like Chiang Mai and Pai, this means cloudy, hot, and sticky weather, but with less rainfall than southern destinations. Southern Thailand is different however, with the east and west coasts experiencing a slightly offset rainy season. Generally speaking, the monsoonal rains run roughly from June through October, with September being the wettest month overall. Yet, on the Andaman side of Thailand (near Phuket and Koh Lanta) rains come as early as April; and in the east (near Koh Tao and Koh Samui) monsoon rains hold off until September. The nice thing about traveling to Laos is that the weather isn't affected by coastal proximity. And while both a dry and rainy season still exist, travel here year-round can be pleasant. Northern Laos experiences a tropical climate, while the southern part of the country is subequatorial, making the weather experience wildly different across its various regions. Add to that the mountainous highlands, where additional cooling and a drop in humidity takes place no matter what the season. In the dry season, from November to April, the northeast monsoonal winds bring cooler temps and low humidity with an average temperature in Vientiane of 77 F (25 C), perfect for visiting the Buddhist temples and shrines. But during the rainy season, from January to May, expect heat and humidity to persevere with the same city experiencing 84 F (29 C). Vietnam doesn't have significant shifts in weather or temperature throughout the year, but because of its elongated shape, the weather differs significantly between the north and the south. Temperatures in Hanoi can be quite cool, actually, with lows reaching 59 F (15 C) during the months of December, January, and February. Northern regions have hot and humid summers and cool and wet winters. The southern part of Vietnam lies within the tropical monsoon zone with November through April being relatively dry and a rainy season lasting from May through October with average temperatures in Ho Chi Minh City of 86 F (30 C). Hit the beach in the south during the dry season to enjoy tolerable weather and a cool dip, or surf, in the ocean. The tropical islands of Indonesia make an excellent choice for destination travel. When Thailand, Laos, Cambodia, and other northern locales are inundated with rain, these islands are experiencing their dry season with temperatures in Bali averaging around 82 F (28 C). The Indonesian archipelago is broad and geological features can influence the weather however, you'll always find a relatively dry nook or cranny to enjoy, even during the rainy season. During the dry season, which opposes Thailand's and lasts from June to September, the days are the coolest, hovering around 79 F (26 C). It's a great time to lounge on a remote beach or go snorkeling or diving to see world-class coral reefs. July is the busiest month to visit, but come November and April, the rains come in and the place clears out. Like Indonesia, the Philippines is spread across a vast archipelago with many islands, volcanoes, and geological features that affect weather. Although technically farther east than much of Southeast Asia, the Philippines are still subject to the southwest monsoon which brings heavy rains from June to September. Because certain island destinations are difficult to reach when the seas become rough, it's best to visit during the dry season in January, February, and March. Definitely avoid May and October however, as typhoons can touch down during these months causing mass devastation and leaving you stranded. June and July are some of the coolest months in Manila, hovering around 82 F (28 C), making it a great time to walk around the ancient walled city of Old Manila. Tiny Singapore is only 1.5 degrees north of the equator where the weather remains reasonably consistent throughout the year. Here, no particular season is better than another for traveling. The temperatures stay pretty much the same throughout the year, averaging around 81 F (27 C), but scorching afternoons can shoot up as high as 86 F (30 C). Luckily, showers tend to pop up at random times during the day to cool things down. So, grab a jacket before you head out to the country's famous botanical gardens because, while the seasons barely differ here, you may encounter a passing shower should you visit between November and January. The same weather system that delivers rain during India's monsoon season also affects Southeast Asian weather. The southwest monsoon typically begins early June and finishes in late September, a pattern that especially affects Thailand between May and October. It's then when rainfall amounts can reach up to 252 millimeters a month. Although no one appreciates rain on a big trip, the annual monsoons replenish fresh water, keep the scenery green, and are crucial for the rice farmers. A minuscule delay in their arrival can cause crops to fail. What to pack: Regardless of when you visit, always pack light cotton clothing, sandals, and flip-flops. If high elevations are in your travel plans, a jacket might be necessary too. In general, climates throughout this region are warm and humid year-round, so make sure your rain gear is light and breathable and your shoes waterproof. Cold air from the Himalayas triggers the northeast monsoon causing destinations like Thailand and neighboring countries to dry out. The best time to visit is between November and February when the temperatures are mild and nights can make it down as low as 64 F (18 C). However, even in what's technically considered the dry season, the farther south you go, the rain becomes more plentiful. The best time to visit Bali and East Timor is usually between May and August when destinations farther north start to become rainy. What to pack: Your suitcase to Southeast Asia should contain pretty much the same types of clothing, no matter in which season you plan to visit. Lightweight clothing made from cotton or moisture-wicking synthetics works perfectly. As do sandals and waterproof trekking shoes, should you plan to venture up high. If your itinerary includes the beach, don't forget your swimsuit, a hat, sunglasses, and sunscreen. The ultraviolet index is high in these countries, making the possibility of sunburn and resulting skin damage high.